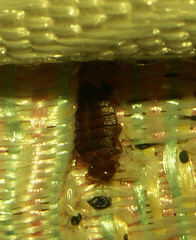 Close up of single female bug on mattress. She is upside down and eggs are below her head and elsewhere. You sound like a disgruntled tenant. I’d love to hear some of your experiences in this building. Why not write another comment as “yourself”? You need not give your real name, or real email address. You can use a nickname. But it would be best to hear your real point of view rather than an ironic point of view of your management company. God she looks like a cockroach. I just want to set her on fire.